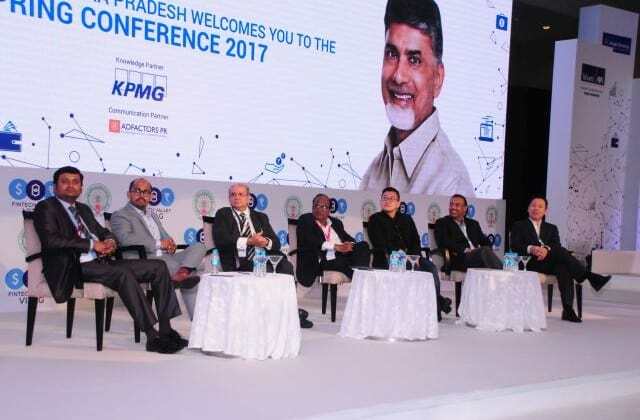 VISAKHAPATNAM: The Government of Andhra Pradesh’s maiden two-day (March 9 and 10, 2017) initiative, the Spring Conference 2017 concluded with 300 Indian and international participants attending the event. Global corporations, governments and academia, along with thought leaders, entrepreneurs, artists and visionaries came together to build capacity, infrastructure, market access, connectivity, funding channels, and incentive mechanisms nurturing a ‘fintectonic’ culture that disrupts traditional models of business and sets a platform for innovation and growth. A prize money of Rs 5 Lakh and one year free office space was provided in the Fintech Tower in Vizag to Start-up challenge winners. Hon’ble Chief Minister of Andhra Pradesh, Nara Chandrababu Naidu interacted with delegates for an hour over video conference and took inputs from fintech community present at the Spring Conference. Contemplating ways in which Blockchain is transforming the future of Financial Services infrastructure, an interactive panel comprised of Akshay Dhanak, Vice President, Business System & Technology, HDFC Life; Sudin Baraokar, Head of Innovation, SBI; Rachna Nath, Partner, KPMG; Vinay Agarwal, CEO, Angel Broking; Paul Kitti, Co-founder, TenX and Hitesh Sarda, Director, Value Labs. The speakers pondered on actions that can be initiated by institutions for reinventing themselves and jointly agreed that industry start-ups that develop the sentiment of trust would instigate disruption. The panellist also took inquisitive questions asked by the audience and shared their excitement for the fintech valley hackathon to be held later in the year. Andhra Pradesh’s Spring Conference 2017 opens new avenues to innovate in fintectonic 0 out of 5 based on 0 ratings. 0 user reviews.